When the U.S. Department of Energy’s Fermilab needed to hire new technicians for jobs across the laboratory, they knew exactly where to look. That’s the guiding philosophy behind the program, now in its third year. The VetTech internship is open to military veterans of all stripes and places those veterans in a wide range of technician jobs, from mechanical to electrical to computing and software development. The hope, say the program’s administrators, is that they will find the right people to fill these jobs permanently, and so far, that has been happening. The VetTech program, the brainchild of Fermilab Neutrino Division Head Steve Brice, began in 2016 as a partnership with College of DuPage, offering internships to veterans who were students working on technical degrees. That first year saw four students given internships, two of whom were hired on full-time. 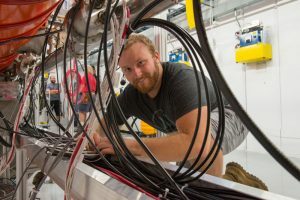 The second year, the program was expanded to include computing disciplines and other colleges, and this year, Fermilab has further widened the program, reaching out not only to community colleges, but also to veterans groups within a 50-mile radius around the laboratory. The result: More than 50 veterans applied for the program this year, 12 of whom were brought aboard as interns. That’s more than the past two years combined, according to the program’s administrators. Mario Lucero, Fermilab diversity and inclusion specialist, agrees, noting that the laboratory has a small but strong veteran community that is fully behind the VetTech effort. Frederick Davis, a student at Joliet Junior College working toward a mechanical engineering degree, was one of the 2018 VetTech interns. Davis joined the U.S. Navy at 19 and spent the next four years working as an engineman on a ship, working with valves, pumps, piping systems and air compressors. 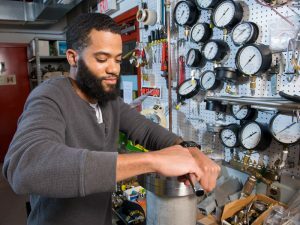 He was eventually put in charge of the calibration shop on his vessel, working to test and calibrate gauges and valves and repair them if necessary. That experience helped him find his place at Fermilab, in the lab’s own calibration shop. Davis has fit right in at Fermilab, and the laboratory plans to work with him as he completes his degree, offering him flexible hours and keeping him part of the Fermilab family. Charles said this flexibility is available to any VetTech intern who wants to stay and does a good job. “We will work to find ways to keep them engaged,” she said, noting it is the same with all of the pipeline internship programs the lab offers. Alexandra Baran is studying materials science and engineering in her fifth year at the Illinois Institute of Technology. She served in the Marine Corps from 2007 to 2012 as an airframe mechanic, and she says her military experience taught her not only valuable technical skills, but also the importance of a good work ethic and caring for one’s colleagues. As a 2018 VetTech intern working in the lab’s Neutrino Division, Baran said she put all those skills to good use. The VetTech program administrators say the program will continue to expand, with plans in the works to further reach out to female veterans. Read more about the VetTech program here.